Introduced in 1981, The Sony ICF-6800W has long been considered one of the “Classic” Sony World Band portables. For years I’ve read printed and on-line articles in which owners waxed enthusiastic over it’s incredible sensitivity, it’s unusual tuning arrangement and it’s rare combination of RF capability and sound quality which owners rank at the top of Sony’s all time best, surpassed in some areas only by the legendary but much more expensive CRF-320. A couple of radio buddies of mine happened to come into possession of this model and it began to pique my interest. Co-incidentally, just before my 6800 arrived a friend of mine loaned me his just-acquired unit so I would have two to compare for this report. His unit had an intermittent problem and mine had burned out lamps so I would soon go inside both of them to see what was up. Two Versions: There were some relatively minor circuit revisions made after serial number 30,000 which have a rather major affect on performance. Models with numbers higher than 30,000 are referred to as the “Orange” version as the model name at the bottom of the front panel was now printed in orange lettering instead of the original white. The orange series had one transistor removed from the pre-selector stage which slightly reduced RF input gain but greatly reduced overloading in the presence of stronger signals. Also new IF filters were used. Most owners agree the orange is the more desirable version…the radio has slightly reduced but still higher than typical gain and it can still overload when used with external antennas, although the flexible user controls allow one to compensate for this. Both of the 6800′s I will discuss here are orange versions. Description: The ICF-6800 is a large shoebox sized AM/FM/SW portable, approximately 18″ v 7″ x 9″ and weighing about 13 pounds with batteries. It is completely self-contained and able to be powered by 6 D cells and incorporating internal antennas for all bands. It is PLL tuned via an analog-feeling knob with both analog and digital readouts and can demodulate SSB broadcasts. It covers standard AM and FM broadcast bands (no expanded band AM except in the SW mode but at reduced sensitivity), plus SW from 1.6 to 30 MHz in no less than 29 spread bands. It can also be powered by AC power from 120-240 volts via a rear panel voltage selector switch (only the Canadian model does not have an external voltage selector), 6 D cells or an external 9 volt source via a DC input jack. There is also an input jack for a timer and output jacks for record, earphone and stereo headphones (although even FM is output in mono…the stereo jack is a convenience to allow both earpieces to be driven from the mono sources). There is a telescoping rod antenna for FM and SW, a large internal ferrite rod for AM and external antenna inputs – SO239 and spring clips for SW and spring clips for AM…all low impedance -c50-75 Ohms. 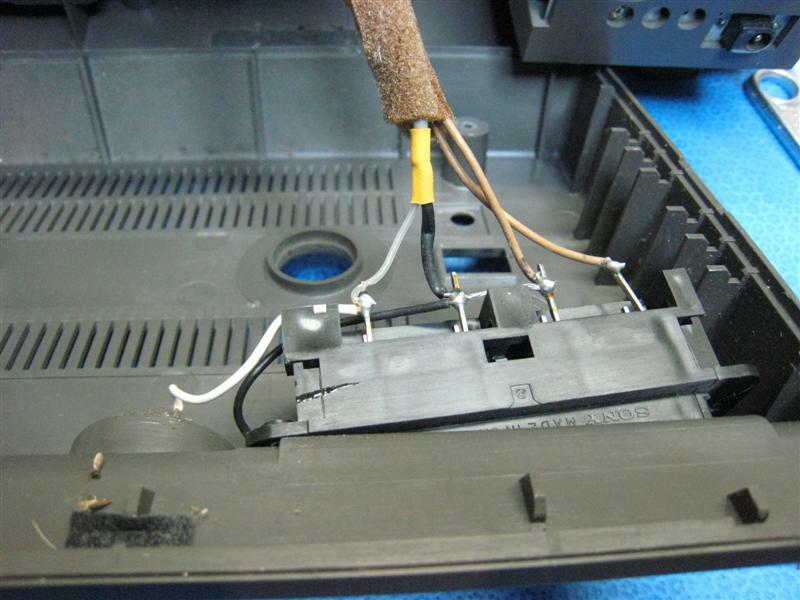 The AM spring clips are connected to a few turns of wire around the ferrite rod which means the ferrite rod cannot be disconnected when an external AM antenna is used. There is a rear panel switch to select Rod or External antennas for SW. The SW spring clips are in fact tied directly to the SO 239 connector and so are of low impedance…this is the first time I’ve ever seen this type of arrangement…again, spring clips or screws are used for bare wires which are generally indicative of a high impedance input. 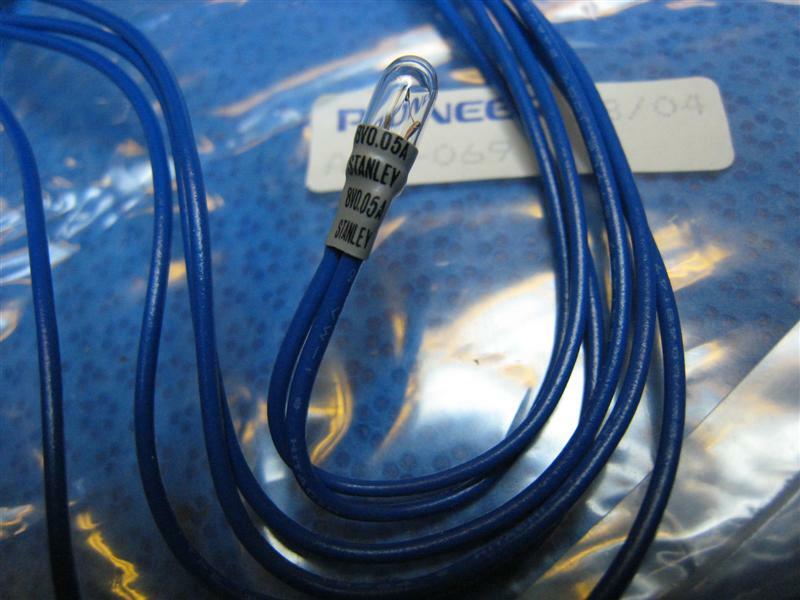 The most important point is to know the impedance so you can get the most out of external antennas with any radio. There is also a pre-selector which aids in front end selectivity and an effective variable RF Gain control as well as a rear panel Local-DX switch, although this switch only affects signals incoming through the external antenna jacks. Two well chosen bandwidths (nominally 9 and 4 KHz) make program listening pleasant in Wide mode and tightly-spaced DXing possible in Narrow mode. The filters have rather broad ranges yet with steep skirts and excellent ultimate rejection the 6800 seems to have sufficient real-world selectivity for the situations I encountered during more than two months of listening…the improved filters of the “orange”seem to have excellent characteristics. The most unique aspect of this radio is its tuning arrangement. The SW spectrum is subdivided into 29 SW spread bands – one each from 1 MHz through 29 MHz in 1 MHz chunks. These SW bands are selected via two concentric knobs. The outer knob selects 0, 10 or 20 MHz ranges and the inner knob then selects the second digit from 0 – 9 MHz. So to tune to 9370 one tunes the outer knob to “0″ and the inner knob to “9″ which puts you in the 9 MHz spread band. Then turn the knob to 370 on the dial drum scale and there you are. To tune to 21470 MHz you would select “2″ with the outer knob, “1″ with the inner knob to reach 21 MHz, then fine tune to 470 with the tuning knob to reach 21470. This is aided by a mechanical drum dial calibrated from 0 – 1000. Of course the digital readout will confirm the frequency, but even so the drum dial is extraordinarily accurate and even has a user calibration on the front panel which lets you zero its graticule perfectly on any given frequency range. On a properly aligned unit it varies very little over its full range. You can thus tune precisely even with the digital display turned off, which the manual suggests you do to conserve battery power. (I like to leave in on though… it’s way too cool to turn it off). AM tuning is more typical via the drum dial calibrated for the standard AM band but still aided by the digital readout. FM has its own dedicated mechanical dial scale and knob…nothing fancy here. The front feet are height adjustable to angle the unit upwards…a nice touch. There is a world map on the flip up top panel which also indicates the SW meter band ranges….the battery compartment is easily accessible under this cover. Oddly the antenna terminals face upwards at the rear which is be convenient for the spring clips but makes the SO239 jack awkward…I used a right angle SO239/PL259 adapter so my antenna cable would not be sticking straight up in the air. Cautions on Buying A Used 6800: Knowing what problems a particular model is prone to developing is important when buying used radios. There area few common problems with 6800′s a potential buyer should be aware of. 1 – Flaky Band Switches: The SW band switches are a common problem on the 6800 and indeed my friend’s 6800 had the problem. Numbers on the digital display just go haywire and bear no relationship to the frequency you should be tuned to. I’ve heard these are tricky to fix but they are standard mechanical switches which can be cleaned like any others. However they’re hard to get to and I suspect some users may overdo the spray and get it into some nearby variable capacitors which can render the radio inoperative. Consider this a word to the wise. (I cleaned the switches on my friend’s 6800 and restored normal operation with no issues). 2 – Weak transistors in the PLL circuits: A knowledgeable radio friend explained to me that several transistors in the PLL stages can become weak with time until the PLL just drops out…when that happens the SW bands die. 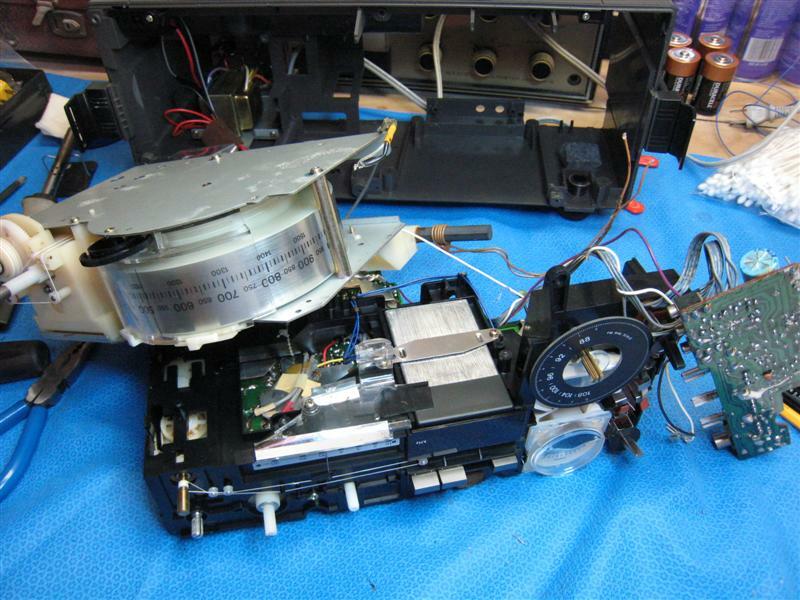 Repair would be easy enough…replace the weak transistors. The problem here is that access is so tough that the radio cannot be operated while those circuit boards are accessible, so his recommendation is to replace all of the transistors in the PLL if you have to go into it at all. Then you are faced with an unusually tedious and difficult electronic setup to get the PLL back to specs…your best hope is that you can avoid this problem all together. Research has shown that this only seems to afflict units under serial number 30,000 which are referred to as the “White version”..the front panel has white lettering rather than orange as on the later units. Stick to the “Orange” version and you won’t have to face this problem. 3 – Unit To Unit Variability: Very common with older electronics. Having seen only two ICF-6800′s so far I can tell you that initially they were as different as night and day. I compared my 6800 with my buddy’s and his was clearly more sensitive than mine, although this varied by frequency. The top of the AM band was miserable on mine compared with his and some SW frequencies were half as strong as indicated on the signal strength meter, while others seemed about the same. I guess the best advice is that you can hopefully compare your 6800 with a known radio to at least determine if its performance seems to be normal at all frequencies. One of the hallmarks of this radio is its exceptional SW sensitivity and if you’re not getting that you’re not getting what this radio is supposed to deliver. We’ll take a look inside shortly. Using the ICF-6800W: This radio seems to embody what for me is the best of both worlds…PLL tuning stability with smooth, continuous tuning which feels absolutely like an analog set. This is enhanced by the fact that in addition to a digital readout you also have a large analog dial which tracks virtually perfectly across not only AM but the entire SW spectrum. In fact, the ability to “tweak” the drum dial’s accuracy to perfection seems to have been designed especially for me…I have long been a virtual fetishist concerning analog dial accuracy…the 6800 lets me have perfect dial readout all the time…truly this is heaven! The only things I could wish for might be a true flywheel effect in the tuning system, variable tuning speeds or a finger dimple or protrusion on the tuning knob to allow it to be spun faster…it simply can’t be spun quickly and it does sometimes seem to take a bit of time to go from one end of a band to the other, especially compared with a modern digital set where you push a button or two and instantly hop anywhere. But the tuning feel is smooth and precise, and SSB signals can be zeroed in to perfection…SSB sounds rock solid and seems 100% stable on this radio with zero noticeable drift. As in other battery/AC sets the illumination is on full time when powered by AC but only comes on at the push of a button on battery power. It remains on for about 15 seconds then slowly fades away…another elegant touch. There is also a cute little map light at the bottom of the front panel…flip it open and it lights up the table area in front of the radio for nighttime reading or logging. The signal strength meter is not calibrated in S-units, but rather from 1-9. Nevertheless it is a useful guide and tuning aid. It is overly optimistic and reads relatively high on most signals. The pre-selector can be peaked using this meter or in the case of fluctuating signals more easily by ear. The Bass and Treble controls provide a nice range of adjustment and the sound quality, although not the best I’ve ever heard is pleasing by World Band Radio standards…Sony is not noted for sound quality in World Band radios but the 6800 is said by many to be their best for sound…of all the Sony’s I’ve heard so far I would agree. Tuning using the band switches along with the combination of digital and analog displays and the large tuning knob is a joy and is one of the things users love about their 6800′s. 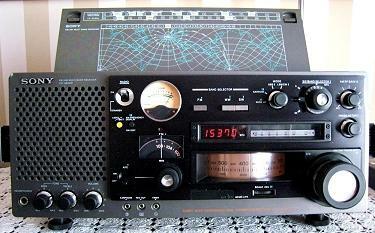 Add to that the pre-selector and RF Gain control and this radio is easy to peak for best reception on any given signal. The pre-selector is relatively broad in its action, so it is not necessary to continually re-tweak it if you are slowly band scanning. It’s only necessary to readjust it occasionally, then once again once you have settled on a station. Likewise it is not intended to help ward off adjacent channel signals…it’s much too broad for that…rather it works to keep out signals which are outside of the general frequency range you are tuning. The impression one gets using the whip for SW on this radio is one of remarkable sensitivity and a low noise floor…clearly the 6800 is one of the hottest SW portables using its whip antenna I have used. AM performance was very good even if not quite in the same league as the SW on this radio, and was especially good with regards to selectivity. FM was more on the ordinary side however…it did fine bringing in my usual signals clearly but is not top tier compared with some of my other portables. Later on in the comparisons section we’ll see just how the Sony stacks up against some other well known models. Disassembly for routine work is unnecessarily complex but becomes easier after you’ve done it a few times. (See pictures). Even the very first step, removing the rear panel, requires that you unsolder the external antenna input connectors. To remove the front panel you need a screwdriver that is longer than the standard 6″size. 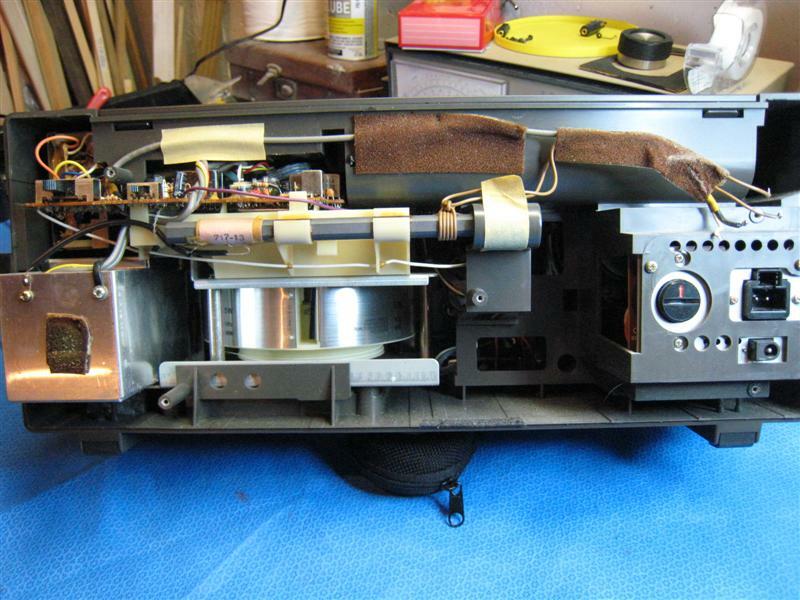 As you remove the front panel, sub-assemblies must be disconnected to allow easy removal, then the chassis can be slid out from the mid section of the cabinet. Then the main chassis can be removed from the tuning drum assembly…you have to go this far to replace the lamp for the drum. The other two lamps are considerably easier to replace. Finding those replacements is another story. I happened to have some in stock from 25 years ago but they are no longer easily available even through major bulb suppliers. I got some spares from a friend in Germany but they are not the exact electrical equivalents…but if and when I need them I think they will do. In other words you may have to be a bit inventive. All bulbs now working I turned to the alignment process. To be clear I did not touch anything related to the PLL on this radio…the PLL circuits seemed to be working properly so there was no need. Plus these adjustments require some test equipment I don’t have and are also time consuming and tedious. I performed only the alignments which might affect the RF performance of my radio…IF and RF adjustments for all bands. When I was done I was heartened that my 6800 now matched my friend’s hotter unit so I was confident it was working as it should. Even the FM performance was dramatically improved with some weak signals improving from virtually no signal meter deflection to nearly full scale…I hadn’t expected that. Next I needed to fix the intermittent band switches on the other 6800. It was easier taking this one apart with the knowledge I had gained from the first disassembly. 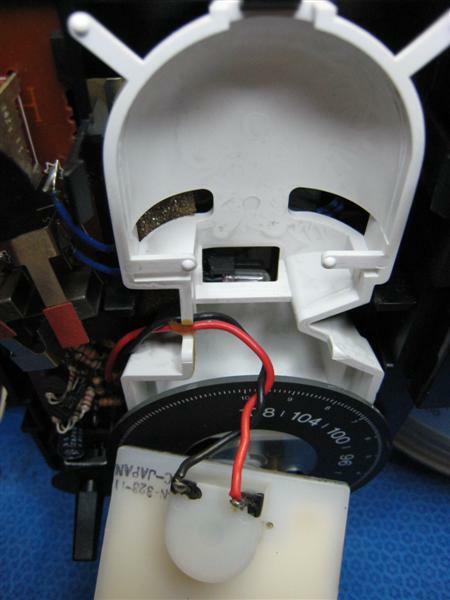 The front panel band switches are connected to plastic actuators which move standard slide switches mounted on the main PCB but one of them was completely hidden from view. It was necessary to do a bit more disassembly to access and clean it, but the cleaning worked and now his PLL was working as perfectly as mine. I now had two properly working 6800′s to compare with each other…I determined they were indistinguishable from each other and was confident both were working up to their specifications. Performance Evaluations: Now for the real fun. The ICF-6800 has the reputation of being among the world’s most sensitive of SW portables. Armed with only its whip antenna it is reputed to be a DX champ so I decided to put it up against several of my favorite reference radios to see how it compared when operating on batteries with built-in antennas as well as using AC power and external antennas. 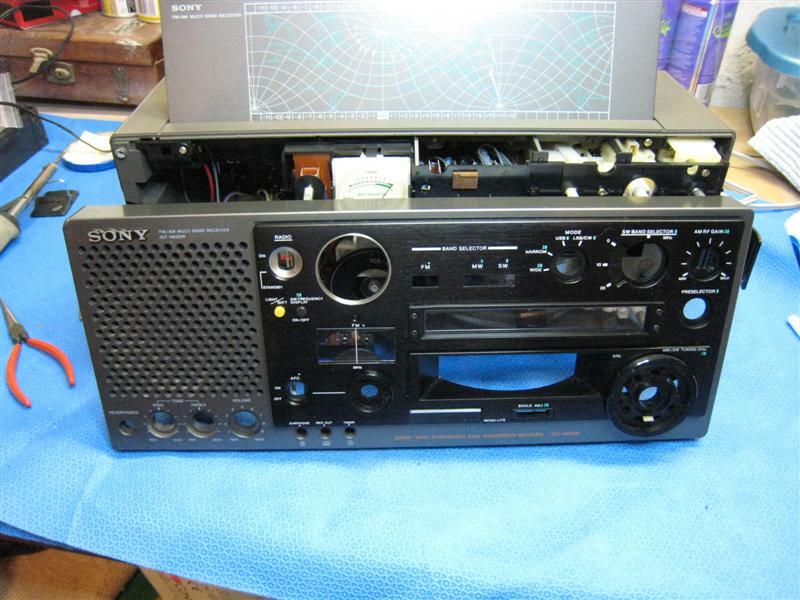 I tested the Sony on AM and SW after quickly determining that its FM was decent but nothing special…fine for pulling in your usual stations when you want to hear them but not a DXing FM receiver by any means. The results were interesting and clearly demonstrated that radios vary dramatically depending on exactly how they are set up and used. In all cases my methodology was to test at midday to check for weak signal sensitivity and at night to check for overload and the ability to hear weak signals in the presence of much stronger ones. These two tests can reveal most of the aspects of a tuner’s capabilities under real world conditions. Excellent SW Sensitivity On The Whip: This was easily verified. The best way to compare radios for raw sensitivity is midday when signals are weakest and most stable. Comparing the Sony with several reference receivers it was quickly obvious that the 6800 has extremely high sensitivity and a low noise floor across the SW spectrum. I checked reception over the course of more than a month, often surrounding myself with several radios tuned simultaneously to weak and medium strength signals. At other times I concentrated on only two radios at a time, pitting the Sony one-on-one against my favorite world band radios. I would often find fading signals which would fade right down into the noise on the other radios while I could still hear the signal on the Sony. The closest competitors were indeed fairly close on some signals but on other signals the Sony was way ahead, rendering several listenable stations that were far weaker sounding on the other sets. I also tuned in some medium to weak signals and found that the Sony usually made them sound stronger…the signals were more stable and had less background noise than on the other radios. (One caveat mentioned in the Sony manual is that the 6800 experiences some interference from its own oscillator when tuned to WWV at 10 or 20 MHz…this is heard as a burbling kind of interference. Although it is unfortunate that it renders WWV less clear on the 6800 than on other good radios it is no way interferes with regular reception of any other signals. All radios have a few frequencies where spurious responses limit reception, but I’ve never seen it occur right smack dab on 10 and 20 MHz. I mention this because it is common to check WWV at its various frequencies not only to check propagation – and the time of course – but I also check these frequencies when initially evaluating SW receivers and one might assume something was wrong with their 6800 if they did not read this warning in the manual). At night when there are many much stronger SW signals the 6800 showed some signs of minor overloading even on its whip antenna. This was evidenced by the fact that some of the less sensitive receivers which have wider RF dynamic range (in this case the Grundig Satellit 800 and Eton E-1) initially pulled in some signals with less background noise than the Sony. However the Sony gives you tools to deal with overload with its RF Gain control and pre-selector. Reducing the gain or tuning the pre-selector slightly away from the desired signal always cleared up any signs of overload and allowed the Sony to perform well. 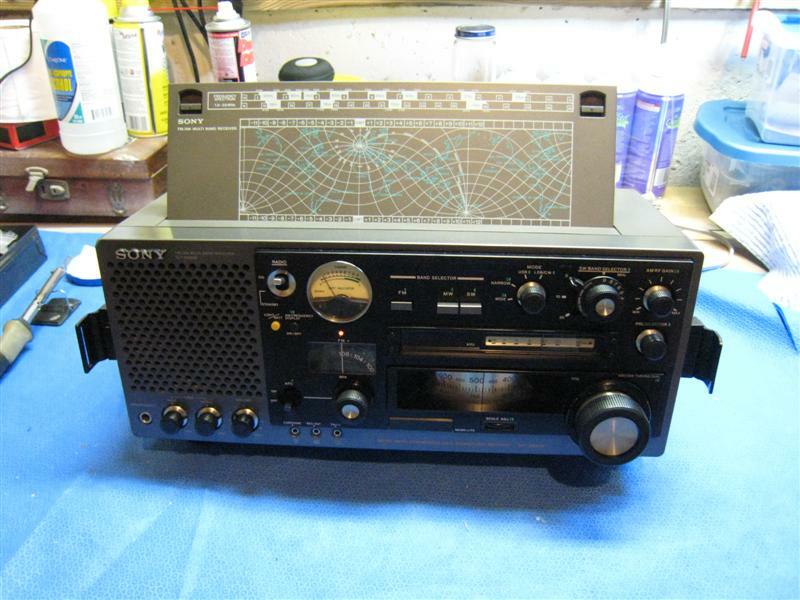 Overall the 6800 did as well at night as it did in the daytime tests…it was able to meet or exceed the reception of all my other radios overall, and there were still some weak signals where the Sony’s extra sensitivity helped. 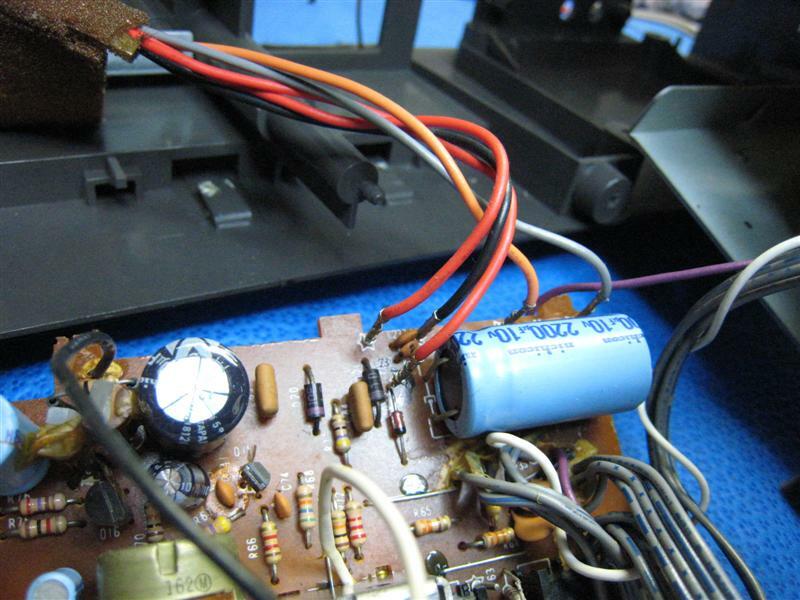 There were a few instances where some of the more modern radios with synchronous detection were able to pluck a tough catch out of the garbage…there’s no doubt that a well-designed sync circuit can be a real advantage. Also some radios have more than two IF bandwidths and as far as I’m concerned the more choices the better, but still the 6800′s two bandwidths strike an excellent balance between wide for good signals and narrow for crowded ones and along with the Sony’s tone controls let me generally get a very pleasing result. With external antennas on SW the Sony again has the flexibility to perform, but user technique will play a big role in what kind of performance you will get out of it…this is a “hands-on” radio and a user with a good grasp of what all the Sony’s adjustments do will get better results than the casual knob twirler, making the 6800 a true enthusiast’s radio. I learned a few tricks with the Sony through trial and error and learned about two of them from a vintage book reviewing this radio. In essence you have to control the Sony’s gain in the presence of many strong signals from an external antenna, especially at night, but there are several ways to do it. The most obvious is the RF Gain control although it has a strange characteristic. I found that there is no apparent change in RF Gain from full to about the 12:00 o’clock position. Once you realize that you will find that all the action occurs between full counter clockwise and 12:00 o’clock. (An interesting note. For some reason Sony chose to very slightly limit the counter clockwise rotation of this control with a small tab on the backside of the knob. If you pull the knob slightly out along its shaft you will find it now turns just a bit further counter-clockwise than it does when it is fully seated. It’s barely enough to make any appreciable difference in gain and don’t ask me why Sony chose to do this with this knob). In many cases this control is all you need to control any overloading. However on a few signals I found that by the time the symptoms of overloading had disappeared the signal sounded a bit weaker (hissier) that it should. In these cases I often got better results by purposely miss-adjusting the pre-selector slightly away from its peak…this tended to reduce the interference while leaving a stronger sounding signal than using the RF Gain control alone. Sometimes it was better to tune the pre-selector higher, sometimes lower…it all depended on the particular situation. In my situation using an amplified loop I never had to resort to use of the rear panel Local/DX switch…but it did knock signals from an external antenna down considerably and should provide excellent overload immunity if you need it with an extremely long external antenna or in areas with extremely high RF levels. Another trick I read about but did not test was to set the rear panel switch to Rod rather than External…according to one source this allows enough signal from an external antenna to be inductively coupled into the radio’s input for use in extreme signal environments…again I did not have to resort to that in my suburban, Northeast US location. SSB: The Sony did an excellent job on SSB, resolving signals right down to a perfect zero beat with as natural a sound quality as I’ve ever heard on any of my portables. It was also extremely stable with no apparent drift whatsoever. Some users complain that SSB tuning is a bit touchy on the 6800 because it has only one tuning speed and no fine tuning, but I nevertheless found it quite easy to tune for best audio and did not find it to be an issue. The 6800 is my favorite SSB receiver as of this writing. The 6800 On AM: The Sony is not my most sensitive AM portable but it is still among the best overall when all aspects of AM performance are taken into consideration. Using its built-in ferrite rod antenna I would describe the 6800 as a relatively sensitive AM radio only slightly behind the best I’ve seen. For example, comparing the 6800 against a Panasonic RF-2200, which is as sensitive on AM as any portable I’ve tested, I find the Sony is slightly noisier on medium to weak daytime signals. But it’s superb IF filters put it in a class ahead of the Panasonic when selectivity or ultimate rejection are an issue. Because of these other attributes of performance I was able to resolve several signals on the Sony which were right at the threshold of audibility which I could not hear on the Panasonic. This is an excellent case in which overall performance is proven to be the result of many factors of RF performance…not sensitivity alone. 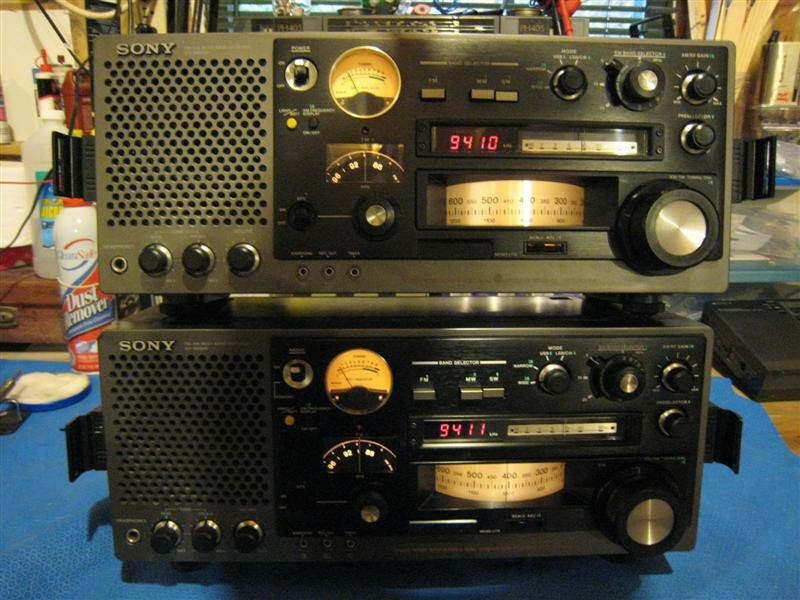 The Sony’s IF filters have excellent shape characteristics (which allows maximum audio bandwidth for any given level of adjacent channel selectivity) as well as excellent ultimate rejection, which allows the Sony to hear some faint signals which are covered by general garbage and interfering signals on the other radios. This also means the Sony is excellent with an external AM antenna…I tried it with several external antennas and found the Sony to be absolutely top notch as an AM DXer…with one caveat. I mentioned in the description that you cannot disconnect the internal ferrite rod AM antenna. This is considered a definite drawback by many enthusiasts, and all else being equal I have to agree, because in some cases that ferrite rod may pick up unwanted interference or noise even though your external antenna is delivering a cleaner signal. So what can you do? Two things: First, you can rotate the radio for minimum interference from the rod. Second, you can reduce the RF gain until the rod’s contribution is below the threshold of audibility, then let the signal from your external antenna dominate. This won’t always work depending on your local circumstances but again, in my suburban location, it works well. I was hard pressed to find a situation in which my AM reception was compromised by the lack of an internal antenna defeat switch. Of course if you live in an Urban environment near an antenna “farm” your results may vary. It may not even be necessary to reduce the RF gain…the extra signal from your external AM antenna will push the AGC level down, thus allowing the signal from your external antenna to overwhelm the signal being picked up by the ferrite rod. Technically not as perfect as disconnecting the rod but in real world listening it may not be much of an issue. Again, the skill of the user will play a large role in the results you get. Conclusions: The Sony “ICF-6800W Orange” is an impressive package. As a stand-alone portable it ranks in the very top tier of world band portables. Using only its built in antennas it will pull in any SW signal as well as or better than any other portable I have compared it with. With external antennas it offers a level of flexibility that lets the user achieve a high level of performance as well. It is not without its quirks however, but then, what radio is? It is not the easiest radio to service…in fact disassembly is downright daunting the first time you have to venture inside. 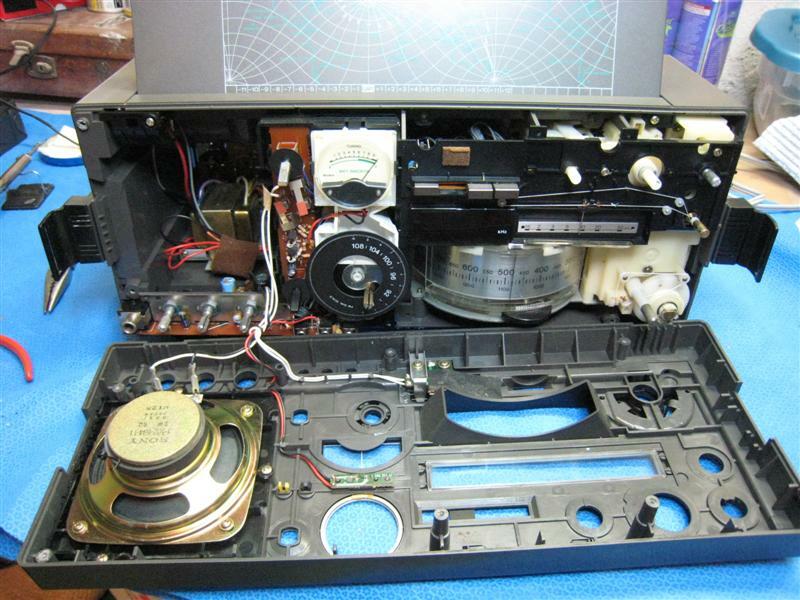 If repairs or adjustments are needed to the PLL circuits you had better set aside a day or two to get it right and you will require a few more items of test equipment than what is needed for working on most vintage radio equipment.. 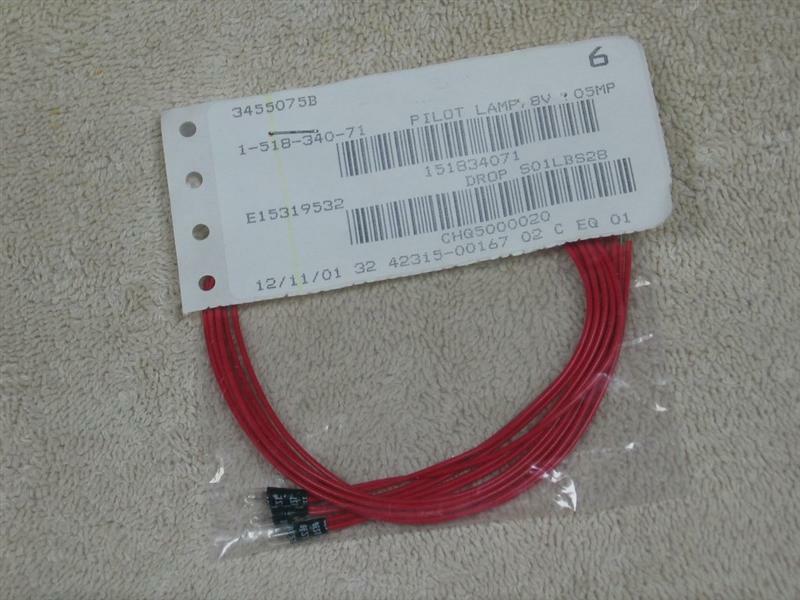 The original lamps seem to be unavailable so unless you happen to have some vintage “lead lamps” rated at 8v 50 ma on hand (as I luckily did) you will have to use different lamps and trial and error to get something that works. If you encounter flaky band switches they can be cleaned but you have to do that disassembly and be very careful not to cause damage by getting spray cleaner into places where it can cause problems. Such is often the nature with vintage radios…ownership of these should imply either that you are willing and capable of venturing inside them yourself or that you have a good friend who can do it for you…repairs to this type of equipment are available at specialty facilities who do vintage equipment repairs, but such repairs can take hours to accomplish and prices generally start at around $300 and go up easily from that point. But when all is said and done I rate the Sony 6800 as one of my very favorite world band portable radios and it has earned a position of respect in my collection.